The Dow up strong Today is currently trading at the T-line. The indexes are giving the indication of bottoming at the same levels they bottomed out in early February. More indicative is the fact that the past week has seen strong oscillations, up and down, showing investor sentiment is very indecisive. The T line will be a very important factor next week, to see if it still remains as a resistance or if investor sentiment can break up through that level. If You Want Versatility, Go Vertical! Options are powerful, flexible tools for all traders and investors, as they allow risk profiles that cannot be obtained using shares of stock alone. One of the most versatile options strategies is a vertical spread. With this strategy, traders can take a bullish or bearish outlook, but with limited risk. In the option’s world, any type of “spread” strategy means you’re simultaneously buying and selling options. You’ll be long and short options at the same time. 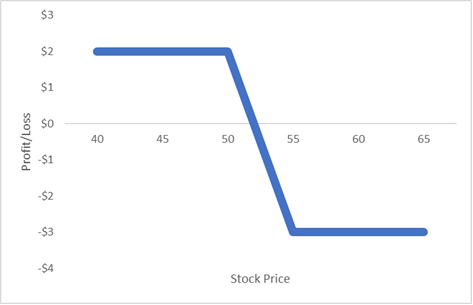 With a vertical spread, you’ll buy and sell different strikes but with the same expiration. For instance, you could buy a May $50 call and simultaneously sell a May $55 call, which is called the 50/55 vertical spread. It’s called a vertical spread because, if you look at an option’s quote board, the expiration dates run horizontally across the top while the strikes run vertically along the side. With this strategy, you’re “spreading” the strikes vertically. Interestingly, you can create the identical profile by using puts. If, instead, you bought the May $50 put and sold the May $55 put, you’ll still have a bullish spread. An easy way to remember is “buy low, sell high” or BLSH, which resembles the word bullish. Any time you buy a low strike option and sell a higher-strike option, whether using calls or puts, you’ll have a bull vertical spread. When using puts, however, the trade results in a credit. If the 50/55 bull spread costs $3, the 50/55 put spread is theoretically worth $2. In other words, you could sell the spread for $2, which is the maximum gain, and would have a $3 maximum loss. You’ll get exactly the same profit and loss diagram as when using calls. Professional traders will always check the pricing relationships for small discrepancies that may arise. For example, if the 50/55 call spread costs $3, the 50/55 put spread is theoretically worth a $2 credit. However, if the put spread is selling for $2.20, you’re better off selling the put spread. You’ll end up with the same profile, just with a greater maximum gain – and a smaller maximum loss. It pays to understand these differences! While there are many reasons for using vertical spreads, probably the main use is to reduce the cost of the long option. If the $50 call costs $10, for example, perhaps you can sell the $55 call for $7, which reduces your net cost to $3. The tradeoff is that you give up the unlimited upside potential you’d have with buying the $50 call by itself. The benefit is that your maximum loss is reduced from $10 to $3. Vertical spreads create great risk-reward profiles. In this example, you can earn 66% on your money, but greatly limit the amount you can lose. However, vertical spreads are flexible. 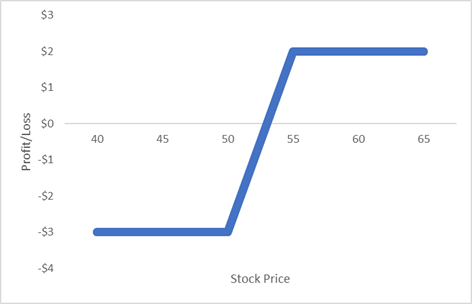 If you have the 50/55 vertical call spread and the stock begins to break out, you can buy back the $55 call to close and keep the $50 call free and clear to capture unlimited gains. What if you’re in a bull spread, but the stock’s heading down? Verticals are versatile, and you can easily change directions. If you have the 50/55 vertical call spread, you can buy the short call’s corresponding put (the put with the same strike). The long $55 put combined with the short $55 call creates what’s called a synthetic short stock position. Those two options behave exactly like short stock. However, when it’s combined with the long $50 call, the net result is a long $50 put. This is a good example of what professional traders call a “morph,” which is a single trade that allows us the change the profit and loss profile. Vertical spreads allow traders to buy options that otherwise may have been too expensive. As you get more experienced, you can even use vertical spreads to trade volatility or even volatility skews. Depending on how the spread is constructed, you can make the position bullish, bearish, or even neutral. You can make them premium outlay – or premium collection. The possibilities are endless with options, but the versatility of verticals is hard to match. P.S. Bill Johnson’s Alpha Trader Options Course takes you from the very beginning, step-by-step, through an exciting journey into the world of options. At the end, you’ll have the necessary knowledge and confidence to start investing and hedging with options. In addition, you’ll have a rock-solid foundation from which to continue your options education. Click here for more information about Bill’s Alpha Trader Options course, now with mult-pay options! The markets continue to show an indecisive lack of direction. Numerous high tech stocks are getting hit hard. Any maintained positions require very compelling bullish or bearish chart patterns. The volatility of the markets require entering trades with the pre-mental expectation of closing out trades immediately if they are not working. This is why we recommend Trend Analysis. Although the Dow is trading up well today, it hasn’t been able to get up through the T-line. The other indexes are not showing any great strength, either trading below where they opened or trading lower on the day. Yesterday’s positive trading in the markets did not create candlestick reversal signals, merely the indication of a bounce in the downtrend. Until there is bullish confirmation, with the indexes closing above the T-line, any long positions in the portfolio require remaining above the T-line. When you do not know what the market is doing, do nothing! Today’s knee-jerk reaction to the upside is now diminishing, the indexes are now trading back below where they opened. Until there is a definite change of investor sentiment, candlestick reversal signals, do not do anything major until the market shows a definite reversal. Today’s expected bounce can be seen in the Dow but the other indexes, after trading slightly higher, are now back down to even or trading lower. Until there is a definite reversal signal, assume the current downtrend remains in progress. Stochastics are now just getting to the oversold level. Yesterday’s damage to bullish sentiment should take at least a few days of support area before the Bulls will likely step back in. Gold and oil are trading positive Today, watch stocks in those sectors. Over the next 13 weeks, Baozun has on average historically risen by 26.5% based on the past 2 years of stock performance. The holding period that leads to the greatest annualized return for Baozun, based on historical prices, is 27 weeks. Should Baozun stock move in the future similarly to its average historical movement over this duration, an annualized return of 302% could result. Over the next 13 weeks, Shopify has on average historically risen by 24.2% based on the past 2 years of stock performance. The holding period that leads to the greatest annualized return for Shopify, based on historical prices, is 1 week. Should Shopify stock move in the future similarly to its average historical movement over this duration, an annualized return of 289% could result. Politics is still the predominant pressure on the markets. Today’s trading has gapped the market indexes down through any perceived possible support levels. Stochastics are not yet in the oversold condition. This is why we recommend Trend Analysis. Today’s slightly positive trading in the indexes still do not demonstrate any conviction one way or the other. The sideways mode of the market is still in progress, Today that might be a function of waiting for the Fed report. Continue to utilize each individual stock chart as the predominant analysis. The candlestick patterns continue to produce higher probability trade results. Although the markets are trading positive today, it has to be viewed with a little bit of skepticism. The indexes are currently in a downtrend. Over the past month it can be seen that the down days show decisive candles while up days are indecisive candles. Any bullish positions should be maintaining above the T-line. Short positions can be maintained when there are no reversal signals being confirmed. The current market downtrend requires bullish confirmation, the Dow needs to get back up above the support level of the wedge formation. Until then, the continued downtrend is a higher probability.